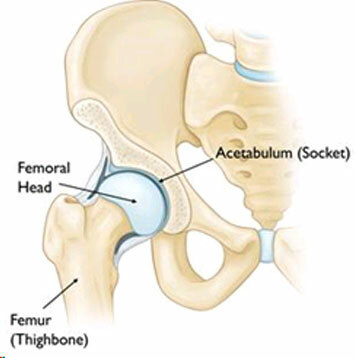 A hip fracture is a break in the proximal part of the femur (thigh) bone. The type of surgery used to treat a hip fracture is primarily based on the bones and soft tissues affected or on the level of the fracture. 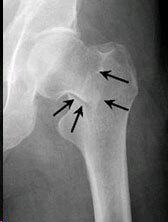 The "hip" is a ball-and-socket joint. It allows the lower limb to bend and rotate at the pel-vis. Hip fractures most commonly occur from a fall or from a direct blow to the side of the hip. Medical conditions such as osteoporosis, cancer, or stress injuries can weaken the bone and make the hip more susceptible to breaking. The patient with a hip fracture will have pain over the outer upper thigh or in the groin. There will be significant discomfort with any attempt to move the hip. If the bone has been weakened by disease (such as a stress injury or cancer), the patient may notice aching in the groin or thigh area for a period of time before the break. If the bone is completely broken, the leg may appear to be shorter than the non-injured leg. The patient will often hold the injured leg in a still position with the foot and knee turned outward. 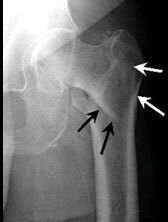 The diagnosis of a hip fracture is generally made by an X-ray of the pelvis and the affected hip and femur. Hip fractures occur at the upper end of the thigh bone (femur). 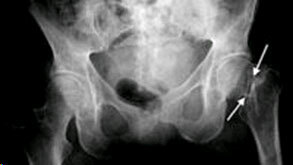 In some cases, if the pa-tient falls and complains of hip pain, an incomplete fracture may not be seen on a regular X-ray. In that case, magnetic resonance imaging MRI or CT scan may be recommended. An MRI may identi-fy a hip fracture otherwise missed on plain X-ray. If the patient is unable to hae an MRI scan be-cause of an associated medical condition, computed tomography (CT) may be obtained instead. These fractures occur between the neck and the head of the femur, and are generally within the cap-sule and may have loss of blood supply to the bone. The capsule is the soft-tissue envelope that con-tains the lubricating and nourishing fluid of the hip joint itself along with the vessels that supply the femoral head. These fractures in a young patient are generally addressed on a urgent basis. Once the diagnosis of the hip fracture has been made, the patient's overall health and medical condi-tion will be evaluated. In very rare cases, the patient may be so ill that surgery would not be recom-mended. Most surgeons agree that patients do better if they are operated on fairly quickly. It is, however, important to insure patients' safety and maximise their overall medical health before sur-gery. This may involve a thorough cardiopulmonary work up along with routine blood investigations and hepatic and renal function assessment of the patient. Patients may be given interim pain relief in the form of anaesthetic injection into the fracture or nerve blockage around the fracture site to keep them comfortable. Patients who might be considered for nonsurgical treatment include those who are too ill to undergo any form of anaesthesia and people who were unable to walk before their injury and may have been confined to a bed or a wheelchair. Certain types of fractures may be considered stable enough to be managed with nonsurgical treatment. Because there is some risk that these "stable" fractures may instead prove unstable and displace (change position), the doctor will need to follow with periodic X-rays of the area and may recommend surgery even at a later date. As such surgery that are de-layed for long may need more complicated intervention. If patients are confined to bed rest as part of the management for these fractures, they will need to be closely monitored for complications that can occur from prolonged immobilisation. These include infections, bed sores, pneumonia, the for-mation of blood clots, and nutritional wasting. Because there is a risk that the fractures may move or displace later on, they are often fixed to avoid potential life threatening complications associated with conservative management. If the head of the femur ("ball") alone is broken, management will be aimed at fixing the cartilage on the ball that has been injured or displaced. Frequently with these injuries, the socket, or acetabu-lum, may also be broken. These injuries may be approached either from either the front or back of the hip. In some cases, both approaches are required in order to clearly see and fix the injured bone. For true intracapsular hip fractures, the surgeon may decide either to fix the fracture with individual screws (percutaneous pinning) or a single larger screw that slides within the barrel of a plate. This compression hip screw will allow the fracture to become more stable by having the broken area im-pact on itself. Occasionally, a secondary screw may be added for stability. Although the fracture is repaired, the blood supply to the "ball" of the femur is damaged. In the older patient, the chance that the head of the femur is damaged in this way is higher. It is generally felt that for these displaced fractures, patients will do better if some of the components of the hip are replaced. 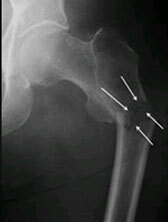 In some cases, this can mean a replacement of the ball, or head of the femur (hemi-arthroplasty). In other cases, this can mean the replacement of both the ball and socket, or head of the femur and acetabulum (total hip replacement). In general, for healthy active person, a total hip replacement will give a long lasting and superior quality of life as compared to hemi-replacement arthroplasty. Most inter-tronchanteric fractures are managed with either a compression hip screw or an intrame-dullary nail (preferred), which also allows for impaction at the fracture site. The compression hip screw is fixed to the outer side of the bone with bone screws and has a large secondary screw (lag screw) that is placed through the plate into the neck and head of the hip (see compression hip screw figure above). The design of the device allows for impaction and compression at the fracture site. This may increase the stability of the area and promote healing. The intramedullary nail is placed directly into the marrow canal of the bone through an opening made at the top of the greater tro-chanter. A lag screw is then placed through the nail and up into the neck and head of the hip. As with the compression hip screw, sliding of the lag screw and impaction of the fracture take place. The nail is in the hollow cavity of the femur (thighbone) rather than on the side of it (as with a plate). There are no definitive studies to show that one device is superior to another., however re-cent evidence has shown intramedullary device to be a more stable device. The decision as to which to use is based on the surgeon's preference and experience. At the subtrochanteric level, most fractures are managed with a long intramedullary nail together with a large lag screw or they are managed with screws that capture the neck and head of the femur or the area immediately underneath it. In order to keep the bones from rotating around the nail or from shortening ("telescoping") on the nail, additional screws may be placed at the lower end of the nail in the area of the knee. These are called interlocking screws. In certain cases, the surgeon may choose to use a plate rather than a nail. The plate will have screws that go into the bone from the lateral, or outer, side of the femur. A single large screw goes into the neck and the head of the fe-mur and appears similar to the compression hip screw, but at a different angle. Secondary screws are then placed through the plate into the bone to hold the fracture in place. A locking plate may be used for more difficult to treat fractures. Patients may be encouraged to get out of bed on the day following surgery with a walker and the assistance of a physical therapist. The amount of weight that is allowed to be placed on the injured leg will be determined by the surgeon and is generally a function of the type of fracture and repair (fixation). The physical therapist will work with the patient to help regain strength and the ability to walk. This process may take up to three months. Most patients are discharged from the hospital to their home. Pain after an injury or surgery is a nat-ural part of the healing process. Medications are often prescribed for short-term pain relief after sur-gery or an injury. Many types of medicines are available to help manage pain, including opioids, non-steroidal anti-inflammatory drugs (NSAIDs), and local anaesthetics. Occasionally, a blood transfusion may be required after surgery, but longer term antibiotics are generally not necessary. Most patients will be placed on medicine to thin their blood to reduce the chances of developing blood clots for up to 6 weeks. These medicines may be in the form of pills or injections. Elastic compression stockings or inflatable compression boots may also be used. You will advised to follow up to check the wound, remove sutures and follow the healing process using X-rays. Following hip fracture surgery, most patients will regain much, if not all of the mobility and independence they had before the injury.